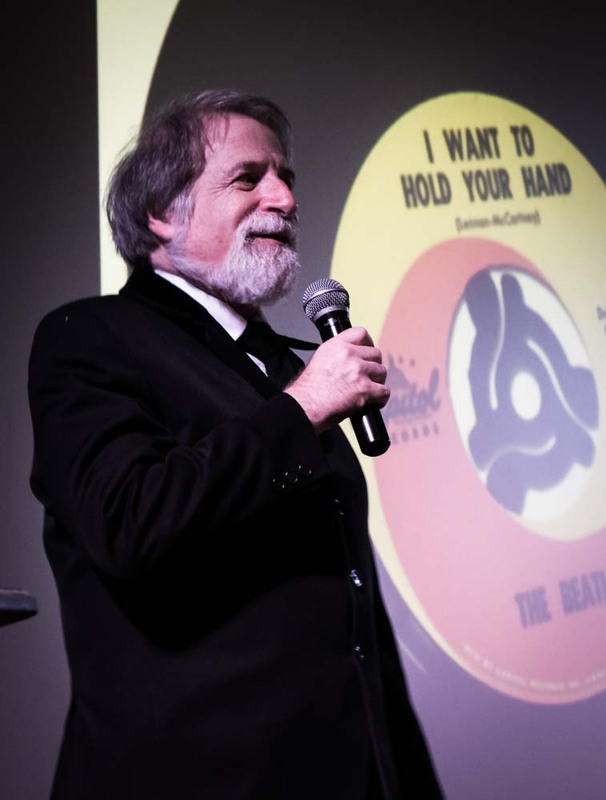 This weekend’s Fest for Beatles Fans in Chicago was a true blast from the past. As usual, it was a great time to relive the glorious music and culture generated by the Beatles. And with the Wizard World Chicago Comic Con next door at the Rosemont Convention Center, the Hyatt Regency O’Hare was ground zero for spotting celebrities and costumed fans. I spotted Marvel Comics legend Stan Lee (co-creator of the Fantastic Four, Spider-Man, Thor, Hulk, Iron Man, the Avengers, Daredevil, etc. ), Lou Ferrigno (who played the Hulk on the TV series) and artist Neal Adams (known for his great work on Batman, X-Men and other comic classics). And of course, there were women dressed up as Wonder Woman and Super-Girl and men in authentic looking Spider-Man and Batman costumes. 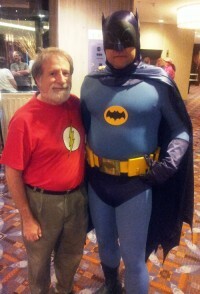 I got into the spirit and spent a few hours at Comic Con before the Fest got going. I purchased a Flash T-shirt and wore it for my A/V presentation on the 50th anniversary of the Beatles, which covered the years 1962 – 63 in the U.K. Just for a laugh, I began my talk saying it was great to be at Comic Com 2012 and followed that with some historical background about how DC Comics editor Julius Schwartz brought back the super heroes to comics in 1956 with his reboot of the Flash at a time when the only super heroes still having their own books were Superman, Batman and Wonder Woman. I wonder how many people in the audience thought I was truly at the wrong place before I said, “Wait a minute, this isn’t Comic Con. 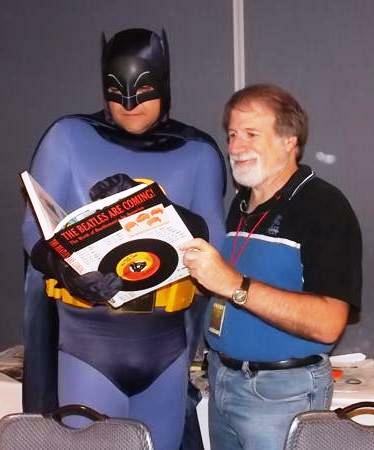 Well I guess I should talk about the Beatles.” For my Sunday presentation on Beatlemania in America, I had a guy in a incredible-looking Adam West mid-sixties style Batman TV series costume join me on stage at the end. (After all, the mid-sixties TV series Batman is the Batman of the Beatles era.) Batman commented on the great detective work done for my Beatles presentation. High praise, indeed, from the world’s greatest detective! Afterwards, Batman dropped by my table to inspect my books. Upon my return to New Orleans, I was thrilled to see that I had a package from Amazon that contained the DC Archives of The Flash, Volume 6. The book contains several classic stories of the Flash that were originally published in 1964. To get in the proper spirit, I listened to “Meet The Beatles!” and “The Beatles’ Second Album” while reading the first few stories in the book. I felt like I was nine years old again! See my review of the book on Amazon, as well as my review of other Flash archive. 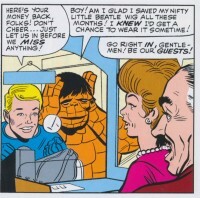 Seeing Stan Lee at the hotel reminded me of a classic story credited to “Swingin’ Stan Lee” in a March 1965 comic book. And that leads to this week’s trivia questions. 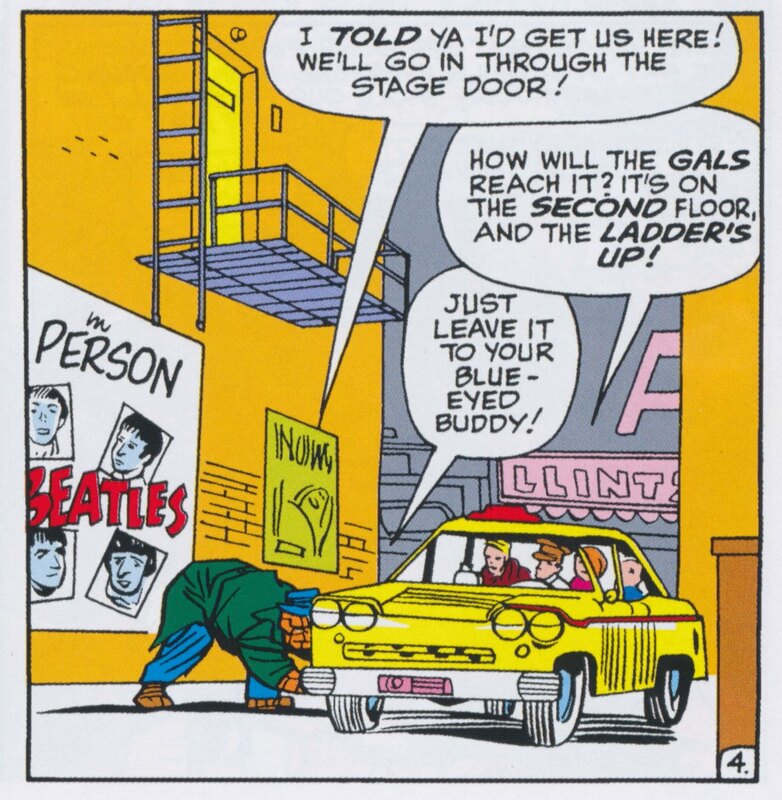 What pair of Marvel super heroes attended a Beatles concert in a Marvel Comic written by Stan Lee for a comic book cover-dated March 1965? Bonus question: What was the title of the story in which they appear and in what magazine did the story run? 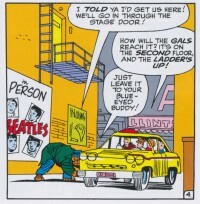 The Human Torch and the Thing attended a Beatles concert in a Marvel comic written by Stan Lee and cover-dated March 1965 (meaning the comic probably went on sale in late 1964). 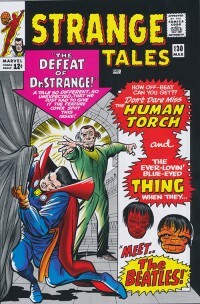 The story was titled “Meet The Beatles!” and appeared in Strange Tales. I guess any story featuring half of the Fantastic Four and the Fab Four is a strange tale, indeed! 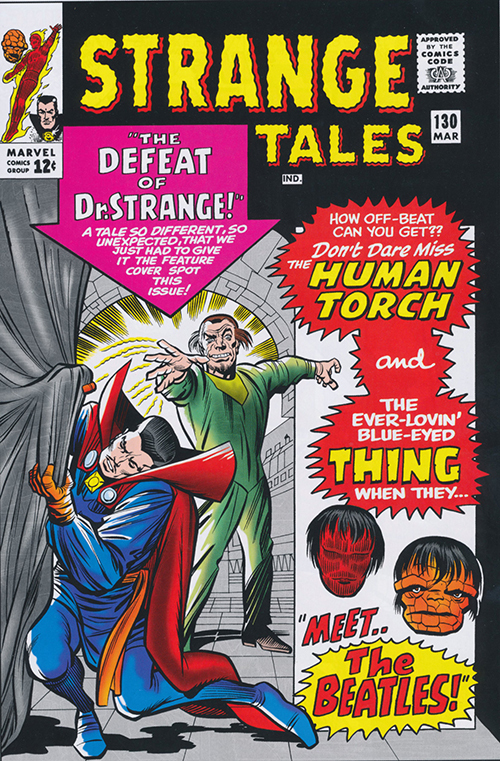 The cover shows the Human Torch and the Thing each wearing a Beatles wig. Seeing the Thing with a Beatles wig on his head is priceless. 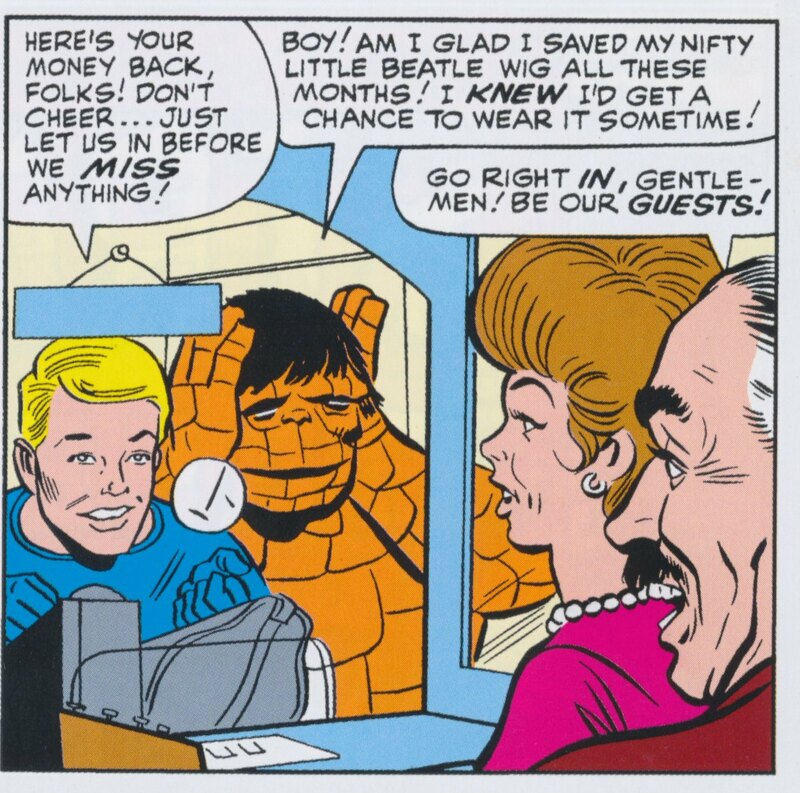 Never mind the fact that the Human Torch’s flame would burn the wig off in seconds.